This document details the AnyConnect client. 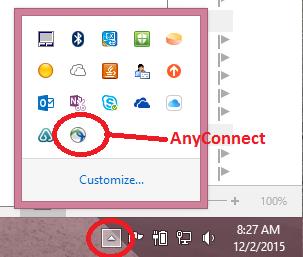 The AnyConnect VPN client requires that your computer meet a few requirements before you will be allowed to connect. 1. You must have windows update set to automatically download and install updates. 2. You must have a firewall enabled. 3. You must have System Center Endpoint Protection installed and enabled. 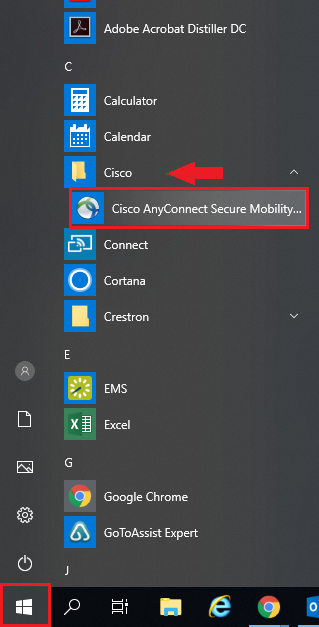 Clients who are eligible for AnyConnect, based on their Level of Assurance (LOA), and who need to install the AnyConnect client can do so by searching for "AnyConnect" in the Software Center. Once the client is installed, you can launch it from the Start Menu or the Notification Area of the Windows Task-bar (near the clock). Enter in your campus username and password to connect. Remember to check your Duo App to approve the authentication push.